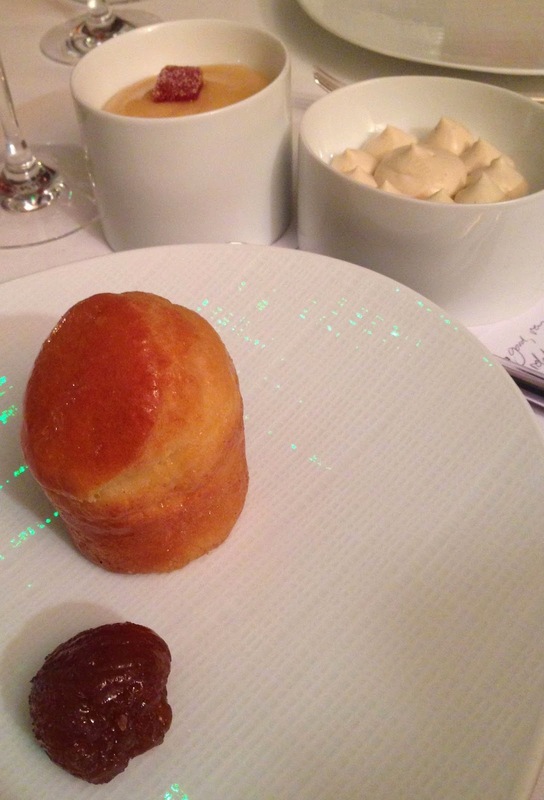 This was a dinner at the excellent “Sommeliers Table” at The Connaught…the first time I had been back since Sussex’s 40th some four and a bit years ago. I am delighted to report the food is as outstanding as I remember it being. The gathering was a very knowledgable and opinionated group which is always good, this was my first outing with this group though I know them all individually. We kicked off with a magnum of Krug 1996 which was tasting very well, serious with real depth and power. There is great acidity which balances the biscuity, saline and savoury palate. Clearly a wine with a long life ahead of it (especially in mag of course). It begged to be drunk but at the same time served the perfect role of making you hungry, very impressive. Thinking about this afterwards I wish I had left a small glass to re-taste later. The main part of the evening was three pairs of red. There was a 1998 in each flight so the fundamental questions were. 1) Did you like both? 2) Did you have a preference? 3) Which one was the 1998? 4) Once 3 was revealed what vintage was the other? 5) Have a stab at what they are? Now clearly getting all five questions answered and recorded for each of 6 wines by the seven who didn’t know the wines was going to be a task – or 210 tasks in fact. So we tried our best and i’ll refer to general themes where I can. Interestingly the there pairs were very obviously from the three regions, namely – Burgundy, Piedmont and Bordeaux. So the first pair was La Tache 1998, DRC & Romanee-Saint-Vivant 2001, S.Cathiard, we had them with two delicious courses. 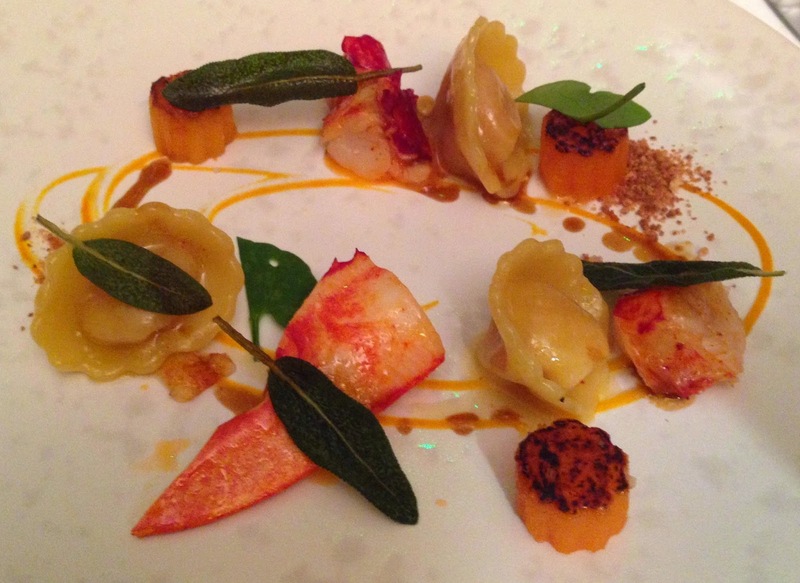 Pumpkin Ravioli, Mostardo di Cremona, lobster with sage and Sea bass with white cocoa beans, clams, calamari, parsley. To start with two of the most sought after and talked about producers is a rare treat. The preference for each was split down the middle. I got the vintage the wrong way round feeling that the initially more savoury nose of the Cathiard was the 1998 and the purity of the nose on the La Tache was 1999. As time went on the initially purity of the La Tache faded an the wine remained complete but may be without the depth you might expect of the this great Cru. The consensus was that it was slightly underwhelming. The Cathiard was just not very 2001 to me. It showed well. A little degraded and deeper/darker of fruit than 2001 would generally be from my experience. There is very little (circa 2.5 barrels) of this made. I liked it, as I think everyone did, I just ever so slightly wished the extraction had been a little more sympathetic…either way a lovely opening pair. 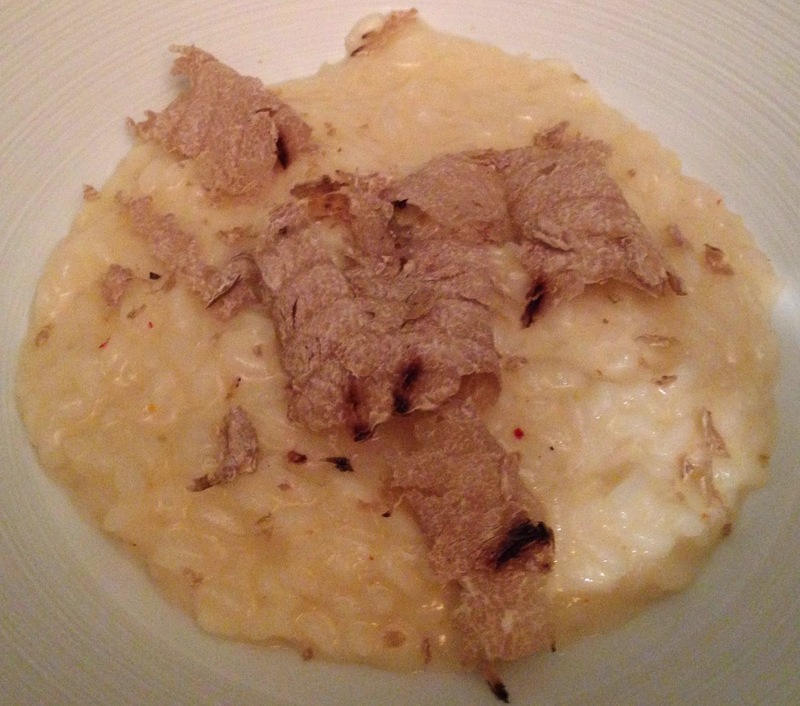 As soon as we were served White Truffle Risotto from Aquerello rice, Parmagiano Reggiano I knew that we would probably be in Piedmont. The dish was great as was the Chicken, Jerusalem artichoke “albufera” that followed. The two wines in question were Barbaresco “Asili” Riserva 1996, Giacosa and Sori San Lorenzo 1998, Gaja. The room was fairly split over the preference possibly a slight leaning toward the Giacosa. 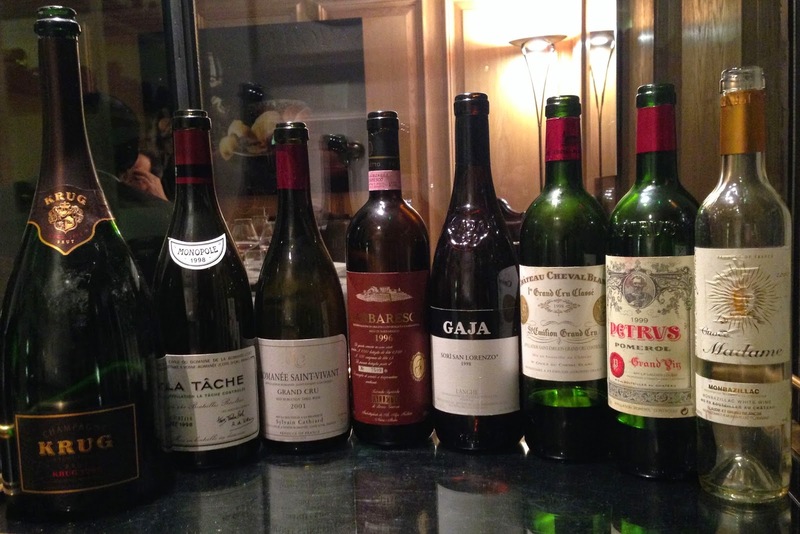 There was a collective failure on the 1998 scenario mostly, I feel, because the Gaja was so incredibly youthful. The Giacosa was open and slightly “frazzled” (a good thing with traditional Nebbiolo), there was sweet fruit on the nose and some oranges, always a traditional oxidative style. The Gaja was a markedly different style but a very impressive wine, vibrantly primary with cherry fruit, dark cherry at that, quite powerful too, I would be fascinated to see if it stays so bold and then fades over time or whether it does degrade and may be show more Nebbiolo character. A lovely pair for the stark differences. 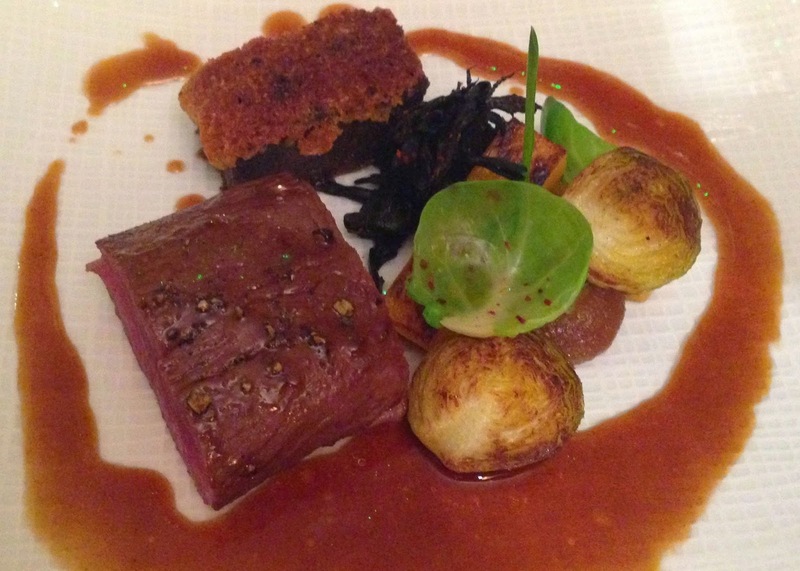 So now Bordeaux – Cheval Blanc 1998 & Petrus 1999 served with Venison, Medjool date, pumpkin and Brussel sprout. This was a brilliant pairing, wine/wine and wine/food. Both wines had such lovely perfumes, helped by the cool but not cold serving temperature. The Cheval was initially more savoury and I think a shade more complex, I had it down as Trotanoy and I did just prefer it when forced, although in honesty I think the whole table loved both. The Petrus was a little closed initially then, with air, a high toned red fruit started to come out more and more, that trade mark Tropicality (not that that is a word) of Petrus. Both wines just had that fruit, structure, savoury balance that you want – really top notch. Both have serious futures but to own either and not have tried them at this lovely stage strikes me as a little bonkers. The sommelier for the evening, Mirko, was then asked to pick a wine for the deliciously comforting and correctly over the top Armagnac Baba with chestnut and quince. We were all discussing mature Sauternes with vintages from 70’s and 80’s getting a few shouts. I thought the wine had an element of Rieussec rancio richness about it…but actually it was Chateau Tirecul-la-Graviere Cuvee Madame 2001, Monbazillac so despite all being “wrong” we were wrong for the right reasons I suppose. A good choice.